Workshop led by Rachael Dobbs exploring all things creative with the fabulous Makey Makey. The group created various instruments making noises with water, toilet rolls, pastry cases, fruit etc…. 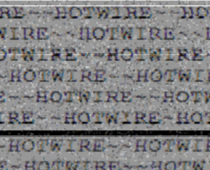 The first night of ~hotwire~ performances included a set of noise by Mike Blow + David Strang and the intense washes of sound by No Such Word as C^nt. Workshop led by led by Neil Rose exploring modular things in Max/MSP…..